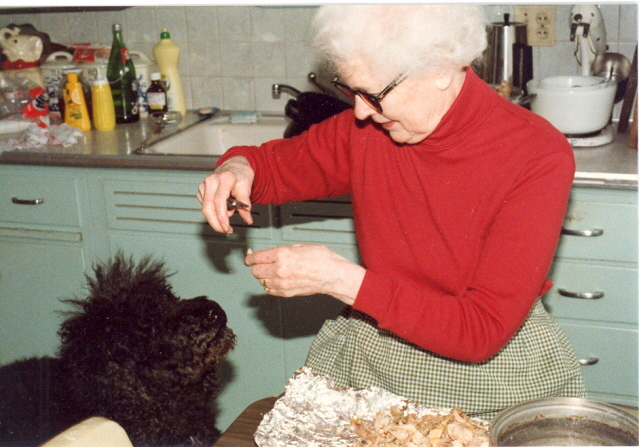 This is my Mo m, now passed on, with Lakeland's Saint Nicolas, aka Nikki, the genesis of poodles in our lives. He was a Christmas present from me to Helen after I left my lab, Gypsy, behind with a friend in order to take a promotion to Minocqua. I knew he would better utilize her hunting skills than the new job would allow me time for. It was a hard decision to make but the right one. Nikki, was never meant to be a hunting dog. However, once he acclimated to the far north and discovered water he would have been a duck hunters dream retriever. He swam like a fish and absolutely loved water. 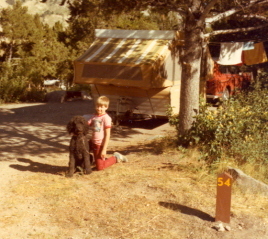 He would stay in the water with our son Jason (seen here with Nikki on a camping trip) and the neighbor kids swimming endlessly without ever wanting or trying to get out. He was tireless in water and often dove trying to catch fish. He died way to young at 10 when I found him in distress early one morning. The vet was not able to save him. He said it was kidney failure. Loki came next. He was totally different then Nikki. He refused to get his feet wet. He was simply a perfect pet; sweet personality, loving, gentle to a fault. Health problems started at about 5 with epilepsy and he had to be put down with cancer at age 7, a very sad time. Here's Nero our new pup with Loki. Once we knew Loki's days were numbered we started looking for another poodle. 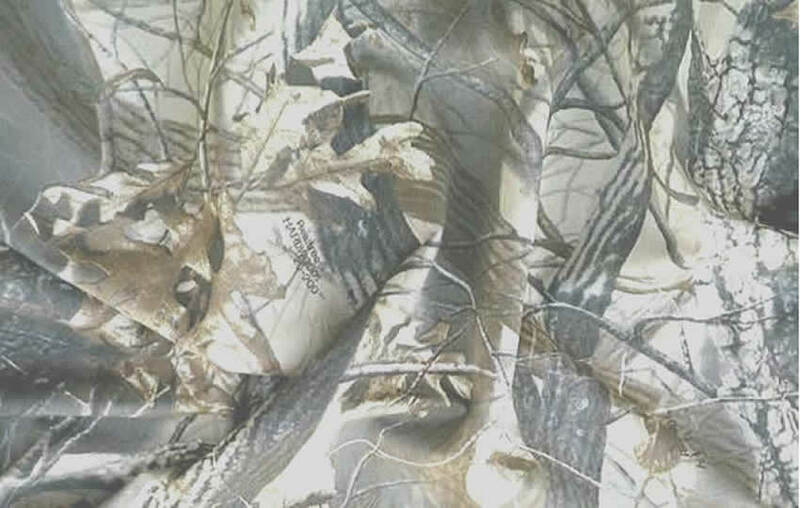 I had long settled into the new job by then and decided I needed to spend more time hunting. With that in mind and not considering a poodle for the job I added Ole, a lab, to our family. Ole lived outside in a kennel. I'll never do that to another dog again. In spite of my good intentions Ole did not get to hunt nearly enough. When he was too old and arthritic from living outside in the harsh Northern WI winters I had to let him go. 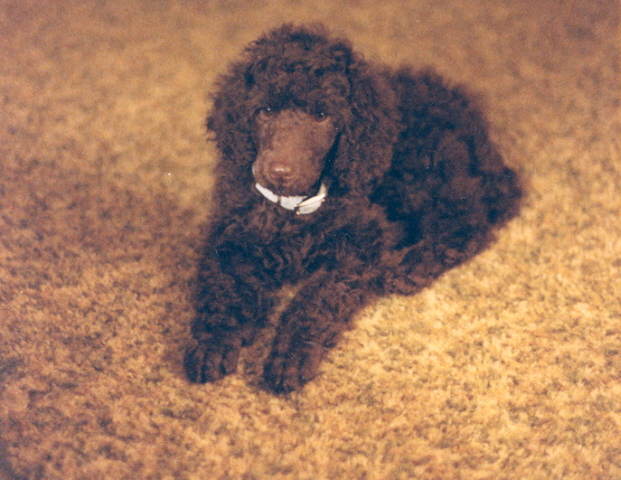 Nero was then 5 and I decided he would be a Hunting Poodle. I retired that next fall. I dug out some very old confiscated ducks from my freezer that had lingered there long forgotten from an over bagging case I'd made several years earlier. Within a couple days Nero was retrieving them like a pro. 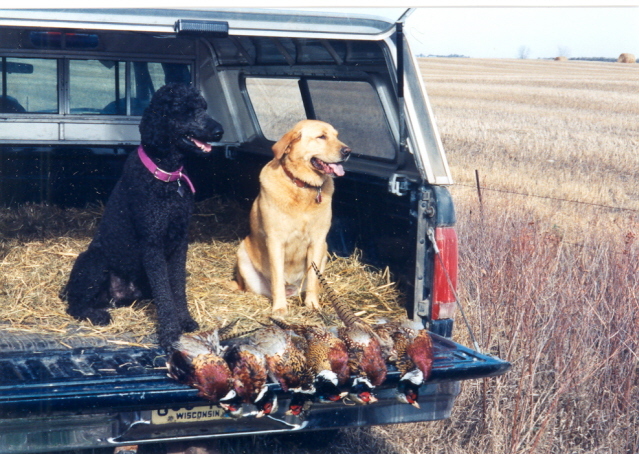 He's shown here with Thea, a friends lab mix, in South Dakota and again with Jay and Dan the next fall. He's also pictured after 3 of us had a nice morning duck hunt in southern WI. It was his first ever duck hunt. I was jump shooting in waist deep water and heavy cover with Nero swimming along behind me. 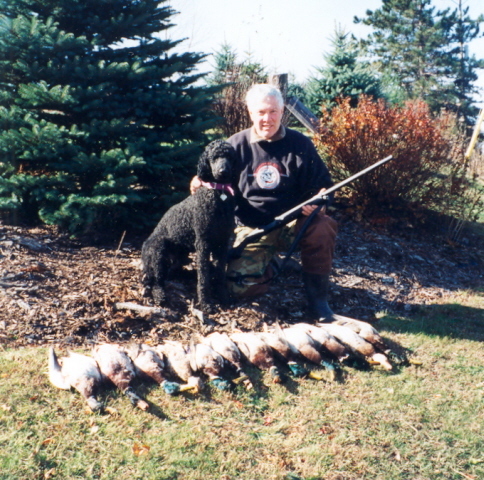 He made some great retrieves on downed birds I never would have found. 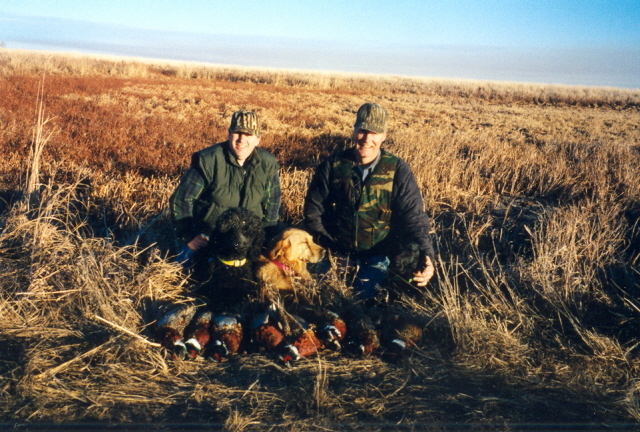 On his first pheasant hunt in SD he could find the truck, that was about all. The following year he figured it out and became adequate, well worth taking along. On the last day of our hunt and still needing one more bird to fill we wing tipped a rooster. With a good head start it out ran Thea, Nero, and Jay's lab into heavy cover where it disappeared. Both labs hunted frantically with no luck. I noticed Nero was laying down looking at me. I walked over to check him out and discovered he was holding down the live rooster with his front feet--had been the whole time. Later in life Nero bloated and could not be saved. 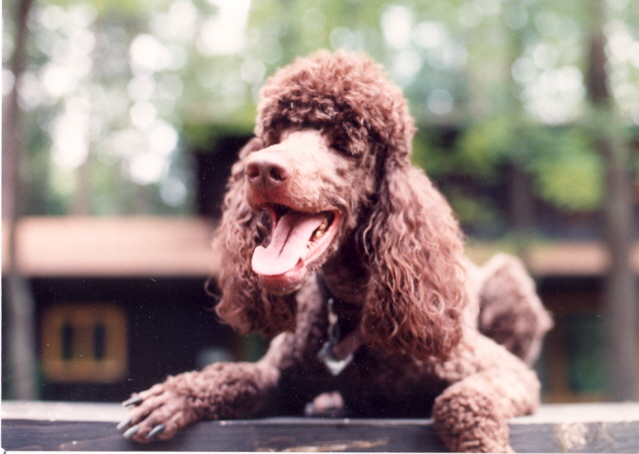 Three sad and shortened lives for our three previous poodles. 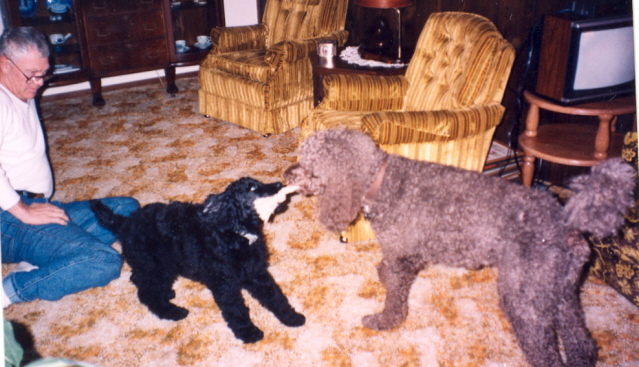 Now you know why and how I became involved with poodles.